Constable Erin Pulham and Senior Constable Gabe Forde set out with their horses Eric and Paddy and patrolled around Sydenham Street. 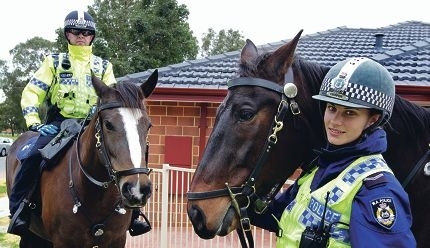 Mounted Division operations manager Sergeant Nick Berragan said the mounted section was a highly visible form of policing that patrolled suburbs during the week as well as Northbridge on the weekend. ‘The patrols target specific areas based on intelligence and crime statistics for each suburb,’ he said. ‘(They) will target known offenders and let them and the rest of the local community know the police are in the area helping to promote confidence as well as giving them someone to talk to. Sgt Berragan said statistics showed mounted police presence in an area significantly reduced the number of crimes reported.